Ayaco Nakamura created the loveable character “USALYMAN”, which depicts the everyday life of Japanese businessmen by using photos and drawings. While studying at Tokyo Polytechnic University (Graduate School of Arts, Field of Photographic Media), Nakamura privately published an illustrated booklet called “Ayaco Weekly”. This booklet lasted to the 100th issue. Although these raised a controversy within faculty members because she submitted them as her graduation work. But some of them accepted her works, thus she could manage to receive a master’s degree. While studying at the graduate school, she took part in a group of photographers named “Stair AUG”, whose members are alumni of the school: Ryo Ohwada, Tomoaki Makino, Naoki Honjyo, and Atsushi Okada. She has energetically participated in solo exhibitions in Saatchi&Saatchi (London, 2007) and B GALLERY produced by BEAMS (Tokyo, 2010). We are excited to announce that “Silence”, the first installment of her long-planned trilogy, is published from Libro Arte. We all came to this world naked, and our death is inevitable. This view of life and death is reflected in Nakamura’s trilogy. The animal bones housed in the museum, which had once held spirit and breathed. The reflection of a tree swinging on the water at night. The school of sardines in the aquarium. And, the light broke through them. 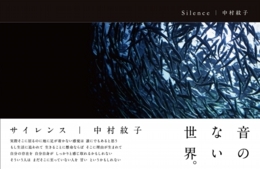 Nakamura’s ideas conveyed in her trilogy―“Silence”,”Birth”, and ”Daylight”―arose when the world struck a core of her heart. In“Silence”, we see the images Nakamura put into focus and photographed with her hearts in the darkness where all sounds seem to fade away. 2009 "y-Generation -6 young photographers-"
2006 "1+14 YOKOHAMA Photo Apartment"